Any one who loves card games will love this tile game. Players make sets and lay them on the table – this is called a 'meld'. The first set must add up to at least 30 points (Add up the tile values) – this is called the "initial meld". If unable to make an initial meld, or a player chooses to delay, they must click the 'get tile' button and pick up and additional tile from the pool. This concludes the players turn. Each player must lay down an initial meld, one cannot manipulate (add or take tiles away from an existing set) a set before laying down an initial meld. Players have a time limit of 60, 90, 120 seconds (as decided by room owner) per turn. If a player hasn’t completed their move before their time is up, they must replace all tiles to their previous position and pick up three tiles from the pool as a penalty. The winner is the first person who empties their rack of tiles. Then calculate the score of each player. 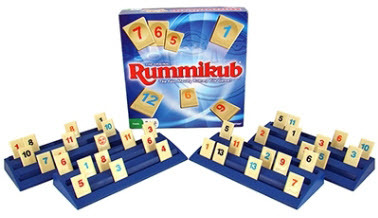 For 2 to 4 players, ages 8 to adult. 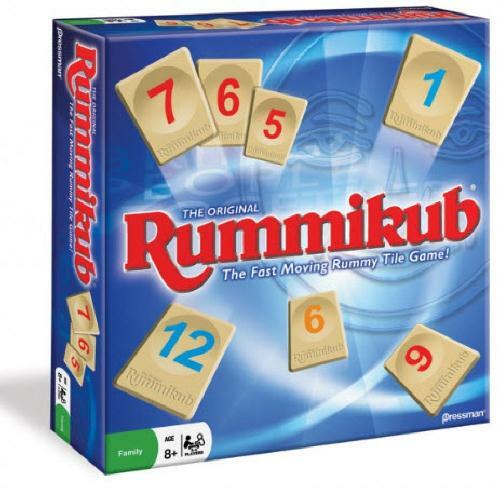 Rummikub MPN 0400-06 Contents: 106 plastic tiles, 4 racks, rules.